Led by Heisman candidate Will Grier, West Virginia had one of the top passing offenses in 2018. West Virginia had the No. 4 passing offense in college football with about 90-100 less attempts than those ranked one through three. The Mountaineers averaged 9.47 yards per pass attempt, putting them in the top 5 of that category. 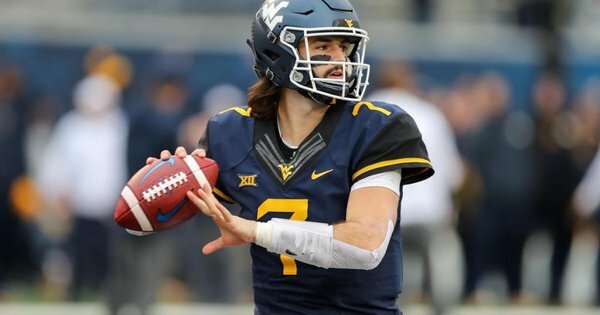 Will Grier played a major part in their offense, but Dana Holgorsen does a fantastic job of putting his players in the right position to be successful. We broke down six All-22 films to see what concepts West Virginia uses consistently and successfully. 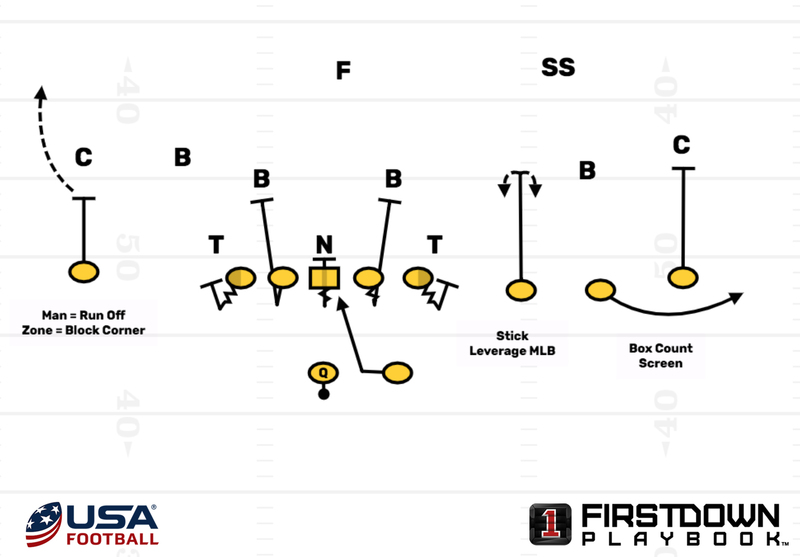 We will talk about one of their top pass and RPO/packaged play concepts. Dana Holgorsen comes from the Air Raid coaching tree like many others in college football. You’ll see he still runs many staples of the Air Raid, but where he differs is in some of his RPO’s and packaged plays. West Virginia bases their offense out of 11 personnel (1 RB, 1 TE, 3 WR), and 10 personnel (1 RB, 4 WR). Their TE/FB in 11 personnel will be in the box for 90 percent of snaps and rarely touches the ball. West Virginia does not do anything outside of the box with formations and motions, but they are creative with their run/pass options and packaged plays. They will always put a LB in conflict on any given run play. They make defenses play slower than they want because they are always putting a defender in a bind. 1. Numbers advantage to the quick screen RPO. If so, get the ball out quick. 2. Box count – If a light box, get the ball to the RB draw. 3. MLB on stick route – playing the box pre-snap, throw the stick. Post-snap, read leverage. In the video below, you’ll see West Virginia in a 10 personnel set. They put trips to the field, with the No. 3 WR cutting his split significantly. In the stick/draw series, West Virginia uses the No. 3 WR in trips as the stick route. He will settle at 5 yards. West Virginia will give their WR freedom in their stick route. If the No. 3 WR sees the MLB widen and get to his outside shoulder, the WR will settle inside of him. If the MLB stays on his inside shoulder, then the No. 3 WR will settle outside of the SLB. In most stick/draw concepts, the No. 1 and 2 WRs will run the stick concept. No. 1 would run an outside release vertical, and the No. 2 WR would run a speed out at 5 yards. In this video, the No. 1 and No. 2 WR run a quick screen RPO. If the QB sees a numbers advantage to No. 1 and 2, he will throw the quick screen RPO. In most cases, a quick screen RPO is a pre-snap indicator, which is easier to determine than a post-snap indicator. The backside WR is locked up on the corner in case the ball were to hit the boundary. Up front, the offensive line is blocking draw. If the QB sees a 5-man box, this is a run indicator. A lot of work has to be done pre-snap for this concept to be successful. In the video, Texas gives a 5-man box to West Virginia. Grier sees the SLB lined up too far outside and the safety playing with depth. This results in Grier hitting the stick route. Grier would also be okay with the ball getting to the back with a light box. Here’s a different example of a defense forcing the ball to go to the back. Tennessee gives WVU a 5-man box. On this play, West Virginia widens No. 3 and forces the defense to adjust and widen as well. With the QB indicator, if he sees a light box, the ball should go to the back. In this video below, you’ll see Texas line up in a 6-man box. Texas pushes their SLB to the No. 2 WR and bumps the MLB over the No. 3 WR. With the MLB playing too tight to the box, Grier again hits the stick concept. With the QB indicator, a 6-man box tells the QB the ball should go outside of the box. Here’s another example where Tennessee lines up in a 5-man box and the ball is forced to go to the back. You’ll see how wide the defense is stretched with the No. 3 WR widening out. Tomorrow, look for part two of this series where we will detail the Air Raid concept "96" that was good for West Virginia as well.